I’ve touched on this subject before, but it keeps coming up in the media, so I’ll take the risk of repeating myself. It then shows a little map with those four cities highlighted, which makes it look like California is breaking out with acne. Three of these cities, San Francisco, San Diego and Los Angeles, are home to a University of California Campus that includes a major medical center teaching facility and extensive bio research facilities. Three of these cluster cities have an additional second University Campus located within a fifty mile range with a medical school and extensive bio research facilities. This worries the lymebuster – perhaps they think this indicates that Morgellons is some kind of escaped pathogen which was simultaneously released from all four of these facilities. Is there any other way of explaining this? The first person I showed this to said there is no possibility that the relationship is random. I am looking for a statistician to calculate what the odds are of these common factors of Morgellons cluster cities being random or not. As someone else on this board likes to say, I’m a duck if all these converging factors are just a coincidence. I bet the odds against this being random are about a billion to one. Close. Let’s see, if there are 400 cities in California, four of which are clusters of Morgellons and four have a med school with a bio research campus, what are the odds of them randomly being in the same four cites? About 25 Billion to one! Higher than their guess, and they were including Texas. So clearly this relationship is NOT random. There must be something going on. The Morgellons Research foundation is just tossing out meaningless sound bites for the evening news, and their fans at Lymebusters are concocting fantastical stories around these McStatistics. I threw away my shoes and wore old socks and treated my feet with tea tree oil. This seemed to stop the pain.Yesterday I put on a laundered, fairly new pair of cotton sweat socks. I think I got them recently from the Dollar Tree store. Wow, my foot pain came back and feet started peeling on bottom.Also, when I did my castor oil rubs on my arms last night, I started getting out ‘white, cotton looking’ fibers instead of my normal black ones. Like the socks had entered my system. I was applying a lot of different creams prescribed by the dermatologist and thought that what was happening was that the material from my socks was being caught up with the cream and being drawn into my foot. However, it is definitely being absorbed as a couple of weeks back I wore a pair of black socks with purple heels and toes – that evening when I was getting undressed a purple fiber about an inch long and quite substantial emerged from my heel. For a while I wore plastic zip lock bags (cut to fit like a sock)over my socks so as not to keep contaminating my shoes. I also started throwing away my socks each day. I have been spending a bundle on socks. [...] Now, however, a new situation has developed. It is minor compared to the previous foot infestation. Each night when I take off my white socks to throw them away, there are all these pieces of cotton fiber from the socks in webs between the toes and even balled up knots of sock fiber.It is not the sort of thing one goes to the doctor to show and tell,but each night it strikes me as very odd. First of all, the fiber is not on the top or bottom of the foot where the sock torches the foot but rather it is in between the toes. Maybe a single piece of fiber could go between toes occasionally. But every night to find a network of sock fiber BETWEEN the toes suggests some unaccounted for activity happening on my feet at the toe area.I do not wash these new cotton socks before wearing. I have never washed new socks before the first wearing. I have never had fibers stuck in webs and balls BETWEEN each of the toes. [...] Yes, I have worried that the fibers are being drawn into the foot by these microscopic critters. They are definitely pulling fibers out of the new socks and practicing their knitting between my toes. Our shoes and socks were very infected with the white and black balls and fibers. We got news shoes and Gold Toe socks that are kinda thin with lots of nylon. I spray my feet, shoes, and socks with Woodward’s Diabetic Basics Instant Foot Sanitizer with benzalkonium chloride. This works pretty well but I still have toenail fungus. My elderly friend with morgs bought some micatin spray from Dermatechrx and sprays it on her clean socks inside out the night before. It was on sale or she would not be doing this. She has clipped all of the cotton linings out of her underpants carefully leaving the rayon or nylon ones and then after these are laundered, soaks them in rubbing alcohol in ziplock bags. Lots of different and inspired approaches as per usual. I’ve been washing the socks in Borax and changing them a few times in the day but didn’t wash them when new. At night after applying Special No 1 ointment, prescribed by dermotologist, I then apply petroleum jelly to create a seal. This has been quite effective in healing some of the lesions so I’ve tried this during the day too but the tingling persists. First of all – anything that comes into my house – if it’s fabric it gets sprayed with ammonia. New clothes get washed with a half-cup of ammonia added to the detergent. I don’t have carpets or curtains anymore. No fabric furniture. But do use blankets, and have had to get new mattresses (sprayed with ammonia)Every load of laundry I do gets ammonia in the wash cycle, not just new stuff. And, because I do chores around horses, and they are constantly wiping their noses on me, blowing their noses on me, etc., I buy shirts at the thrift shop. I wash those with ammonia and am just fine with that. No problemo – no itching caused by the thrift shop shirts – ammonia fixes stuff for me. The socks i have been buying really have a lot of loose cotton fibers and balls on the inside. Today, I picke the stuff off before I put on a pair. Three hours later, I peeled them off and looked inside. All the loose stuff had re-appeared. Much was sticking to my feet and liked the area between my toes. I am coming to the conclusion that these socks are alive. I was initially infected by new cotton socks right out of the sack that I did not wash first. There is little if any doubt that cotton is one of several of the more ubiquitous vectors for this thing. I think what we are seeing here is the result of the culture of belief within Lymebusters. Nobody steps forward to suggest to B that it’s quite normal for cotton from new socks to collect between the toes. Nobody tells BLW that his socks are probably not alive, and everyone has experienced cotton balls and fluff on their feet from new socks. Nobody tells H that, yes, the fiber was probably just caught in your foot cream. Nobody tells CM that there actually is rather a lot of doubt that cotton socks are a vector for a novel pathogen. I think willingness to believe others that some of the above people have, is paired with a willingness to believe themselves. Hence whatever idea pops into their head, they believe without question. Questioning themselves (are my socks really alive?) is tantamount to admitting they might have made some mistakes in other area, and perhaps an indication that they were deluded in some beliefs. Socks are interesting since most people have two feet. It would be a very simple matter to perform experiments such as wearing a cotton sock on one foot, and a linen sock on the other for a week, and see if there is any difference. You could use this technique to test the various (“different and inspired”) sock treatments, such as ammonia, alcohol, bleaching, borax, boiling etc. But is seems some people don’t want to investigate, to find the truth. They just want to believe. This uncritical desire for belief is ultimately damaging their health. 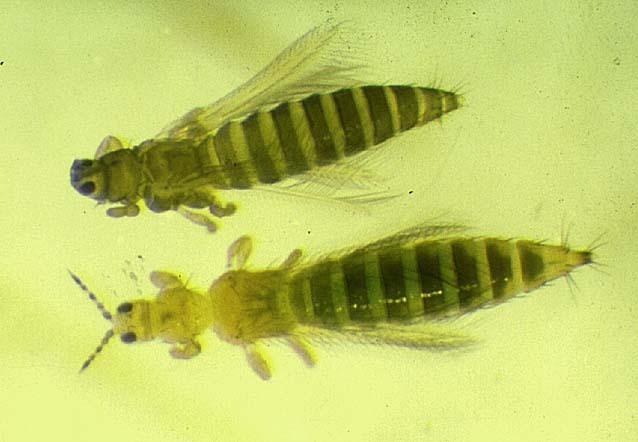 Thrips are tiny winged insects, around 1mm (1/32th of an inch) long. Thrips infest plants. 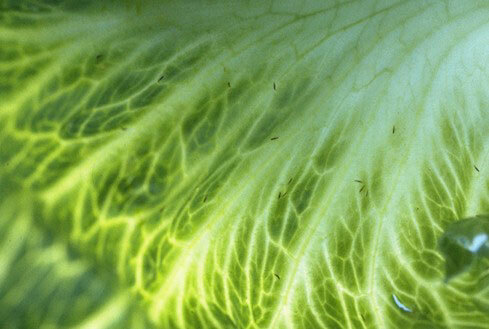 A serious infestation can have hundreds, even thousands, of thrips in a plant. 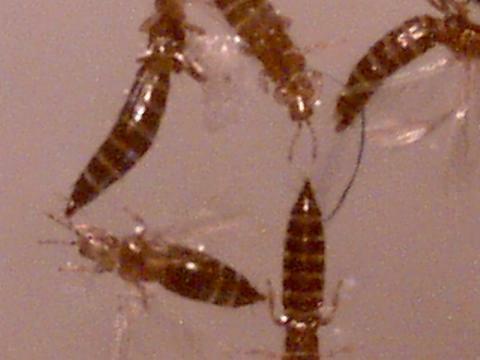 Sometimes thrips swarm, they fly, and can land on your skin and bite, which can be painful. They can apparently even create lesions that they can get inside, a condition described as Thysanoptera dermatitis. So suppose you had a thrips infestation, perhaps just on a houseplant, or perhaps you live in an agricultural area, or you have an orchard. Thrips are tiny (they can easily get through a normal window screen) and very hard to see when they are in the air. If you are closely inspecting your skin, then when the thrips land on your skin, it will be difficult to see where they came from. If you have a fertile imagination, it might look like they have emerged from your unbroken skin. 1) There are no insects involved with Morgellons, and people should stop talking about them. 2) Insects are not part of Morgellons, but it suppresses your immune system enough to allow insects to nest in your skin. 4) Insects are part of the Morgellons syndrome, but we should not talk about it, as it will get us labeled as suffering from Delusions of Parasitosis. On Lymebusters (the online forum that the MRF recommends), the thread entitled “Morgellons, (collembola? )” sums up the every shifting attitudes of some Morgellons believers. Those that have the insects hatching are suffering a very bad aspect of this – they need so much support and especially to be believed and not rejected. We never told anyone they couldn’t talk about it and I apologize again if it sounded that way. We just didn’t want people to place the main emphasis of this disease’s symptoms on that aspect of it, since that is where our skeptics are getting their ammunition to dismiss us. We all have fibers–etc=====or defined as morgellons,some have this manifestation others some other presentation..we can not define it down to say morgellons is caused by this or that—this is what I see–That is what you see–but we all see fibers, right?SOO, I ask, why are the fibers created by so many different things? Here’s how one of the administrators of Lymebusters (who has posted his own photos of Thrips) explains his own pro-insect belief, and the diversity of what people are seeing. So what is the problem with Thrips? The problem is the assumption, almost the dogma, amongst Morgellons believers, that they all have the same “thing”. That there is some new pathogen that they all are infected with that causes all of their symptoms. Any new symptom that someone professes to have gets included in the long list of symptoms that are allowed under Morgellons. Anything too outrageous or unique gets explained as a product of a suppressed immune system. Any mental issues get explained as neurological effects of “this disease”. The problem with that is that they obviously don’t all have the same thing. They have a wide range of symptoms. The one thing they supposedly have in common, the fibers, vary as much as the symptoms. On the question of insects – some have them, and some don’t. Again, some believers explain this as the insects taking advantage of a compromised immune system. But you can explain anything as the result of a compromised immune system. The trouble with Thrips is that believers unquestioningly accepted that tiny bugs can be hatched in their adult form directly through your skin, if you have Morgellons. If you have Morgellons almost anything can be accepted, no matter how outrageous. The key thing many Morgellons believers want is “to be believed”. By being part of a community that wants to be believed, they support each other, and hence they believe each other, easily glossing over all inconsistencies. Unfortunately, by believing everyone and everything, some of them abdicate reason, and this gets in the way of them receiving appropriate treatment for their very real health issues. “Please know that hope truly is on the horizon. Please do not poison your body with pesticides and toxic chemicals while this mystery is unfolding. You must remain as healthy as possible. I also have the stabbing ones, usually the stabbing is in the region of the lower legs and ankles. I can pretty much control this by spraying natural insect repellant on my lower legs everyday. If I forget I get the stabs. Also spraying the carpeting lightly with cedar oil spray helps. These things also float around in the air. I have a big plastic spray bottle that is one quarter water and three quarters Everclear Grain Alcohol that I added grapefruit seed extract to, also added lavender and teatree essential oils. This makes a great spray to clear the floaters out of the air, also like to spray my sheets with it before I get into bed at night. [...] I sat down in front of the computer, turned it on and within 20 minutes I was being swarmed by stuff! I looked at the computer screen and saw the “things” that most of us have. The cube that I sat in was very dusty. So I got out the H2O2 and wiped everything down, wiped my face off, and the swarming stopped. If a Dr wants to be in denial that something physical is wrong then he has to do it on his own time and without me in the room. I have fired about 15 Dr.’s for the way they talked to me . I finally got sick of it and started trying things on my own. Then my nurse friend sent me to her Dr friend and he listens and he is at least trying. I have been to 32 Dr.’s in 3 years. These are not unusual posts. They are quite typical, and they go without comment. There are far worse posts in there, but I limited it to the last 48 hours, and left out the suicidal rambles. So why is Lymebusters the semi-official discussion board of the Morgellons Research Foundation? It really can’t help their image. Lymebusters, as has been noted several times in comments here, is not a very healthy place. It’s a place where people build and reinforce errant belief structures, and a place where vulnerable people can easily be snared. How can the MRF say “Please do not poison your body with pesticides and toxic chemicals while this mystery is unfolding” and then two paragraphs later direct them to Lymebusters, where people discuss assailing their skin with bleach, Everclear, tweezers and worse. be $600 charged on the credit card. I got the written report too, my fibers were identified as follows: black wool fibers, red wool fibers, blue wool fibers, colorless wool fibers, colorless polyester fibers, a blue polyester fiber, colorless cotton fibers, blue cotton fibers, a pink acrylic fiber, and a green acrylic fiber. They were examined by polarized light microscopy. He sent one photomicrograph depicting typical woolen fiber from one of my samples. The NPA worked with McCrone’s – Chicago, back in the 90′s, when Dr. Walter McCrone was still living, interested in the fiber-skin issues, and either Dr. McCrone or Dr. John Shane, McCrone’s chief researcher at the time, designed a protocol for us to follow. Participants strictly adhered to the protocol. As I recall there may have been twelve of us who submitted “specimens” to McCrone’s Research Laboratory.Shower, shampoo, air dry, no towels, no hair dryers, no sitting on upholstered furniture during the process of combing and collecting from our skin.Results same as yours! Various fibers identified by content and color including Flax, Wool, Lycra, Cotten, Polyester, etc. Thanks for sharing this information and naming the lab involved. Maddening that it was such an expensive process for you. I recall that it was an expensive process, but the amount you were charged is outrageous. Okay, so a whole bunch of people had their fibers tested, under fairly rigerous conditions, and the results were that the fibers were regular household fibers. Yet the response is simply to deny the results, and complain about the cost. Why would the labs make up results? Seems like the submitters had already made up their minds about the fibers and were just seeking validation. Fibers are everywhere. They float in the air and land on you after showering, and they also remain on your skin even after showering.